AutoCAD limits you to one drawing at a time. TR33 Tools offers applications enabling you to edit multiple drawings without opening them. Update text on dozens of drawings in seconds. Confirm standards. Create reports in excel. Modify visibility states in dynamic blocks. Increment tag numbers. And more. BlockMatrix delivers powerful, easy editing of block attributes in a familiar spreadsheet style format. BlockMatrix is a considerable time saver. 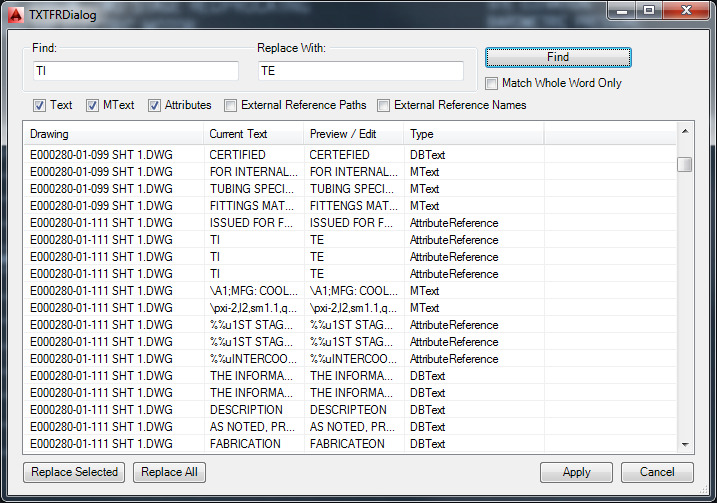 Find/Replace across multiple drawing files, increment integer values (very useful on tag numbers! ), and change the visibility state of dynamic blocks. Free trial available at the Autodesk Exchange Store. AutoCAD® find and replace function is a powerful staple; however it only works on the drawing you have open. FRTX extends that power to an entire folder of drawings. Have you ever had to change a note on a drawing? What if that note is shown on dozens of drawings? Have you or your designers or engineers ever made a typo? What if that typo is shown on dozens of drawings? Opening and fixing that text in all those drawings could take the designer hours upon hours. FRTX will do that work in a matter of seconds, not hours. What all can this tool do? Find and replace across multiple drawings at once. Match search strings intelligently with whole word detection. Edit results individually in place, in the dialog. Repath and rename XREFs using find and replace. Ordinate dimensions are required components of many drawings in many manufacturing disciplines. When placing an ordinate dimension in AutoCAD®, the anchor point for the dimension does not calculate the length of the text that will be shown. The user is then left with misaligned dimensions. With Align OD the user can align those dimensions in seconds, putting a professional touch to a tidy, easy to read drawing.